AHM (Associated Hobby Manufacturers) appears around 1960 in the North American market. Headed by Bernie Paul, AHM imported hobby products from a number of locations around the world. Primarily remembered today for its model railroading lines, which largely consisted of HO-scale (1/87th) offerings, AHM also saw itself with N-scale (1/160th) and O-scale (1/48th) trains for a limited time around 1970. 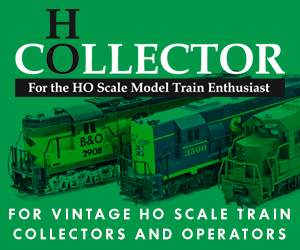 AHM’s HO-scale releases came into prominence during the early-to-mid 1960s. During this time, the company imported a very good 40-foot sliding-door boxcar model from Roco in Austria, Rivarossi of Italy supplied a U25C diesel, scale-length heavyweight and smooth-side streamline passenger cars, as well as the start of an impressive run of steam locomotives that included Berkshires, Big Boys, Heislers, and Hudsons. The first major HO-scale steam locomotive from AHM-Rivarossi was the mid-1960s articulated Norfolk & Western Y6 mallet offering. Other sources supplying AHM products included Pola of West Germany, Pocher of Italy, Mehano of Yugoslavia, as well as Hong Kong/Taiwan offerings from Kader. By the early 1980s, AHM’s fortunes were in trouble and the company ceased doing business by the mid-1980s.